We are a family owned and operated marketing company, and we extend our family culture to the way we do business. At TWH Agency, you are not just another number and you are not treated as a commodity. 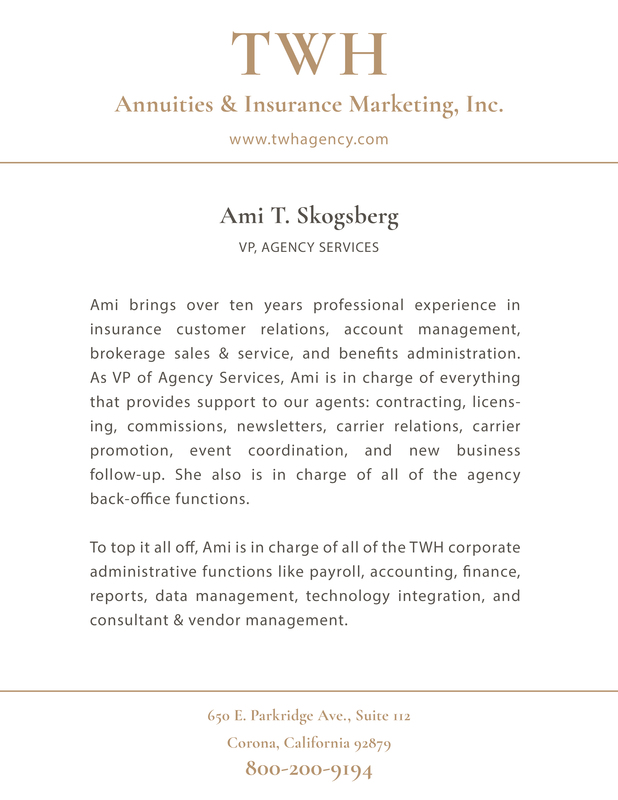 TWH Agency values each client as a business partner. We welcome you to join our TWH family and see the difference in the way we work and provide creative solutions for independent producers. TWH is committed to providing you, the independent producer, all the resources needed to increase your sales and income. 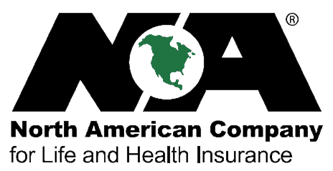 We specialize in annuities, long-term care and specialty plans. We offer contracting with top-rated companies, sales training, seminars, lead programs, continuing education, and sales support. Regardless of your level of expertise, we are here to help you. As an independent advisor, you need to have access to a whole gamut of resources. 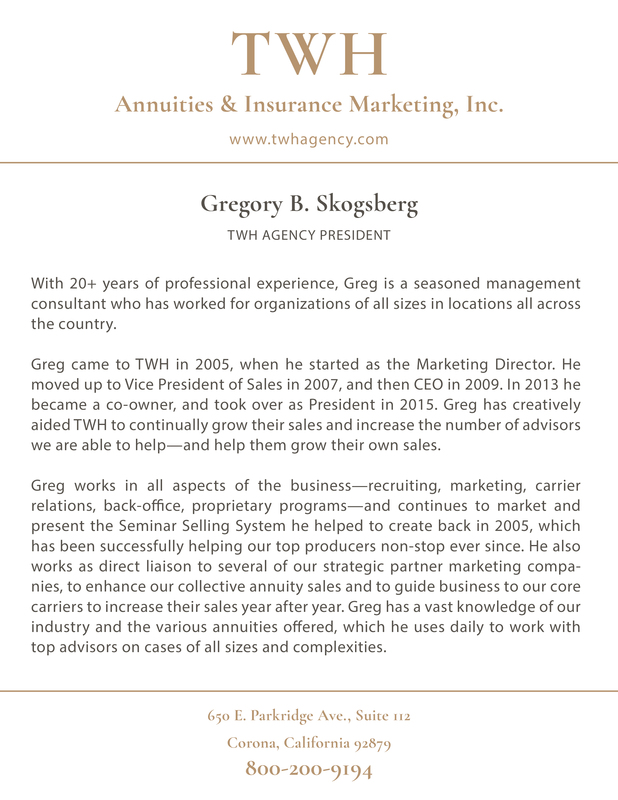 TWH Agency is a lean, agile and creative marketing company that is focused solely on making each and every one of your client meetings a success. Whether you need a simple term quote, a full client retirement plan design, or a multi-tiered marketing strategy, we have the tools, talent, team and time you are looking for. Any marketing company can offer products. 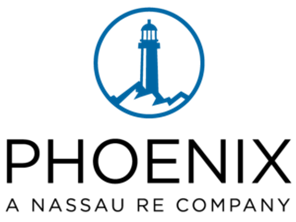 We advise you of the most competitive annuities and life policies in the industry. We don’t just help you make a sale — we help you with product research and selection, case design, sales presentation strategies, custom illustrations, presentation rehearsal, and up-to-date forms and brochures. We make sure you meet your clients’ needs so well that they can’t wait to tell their friends about you. 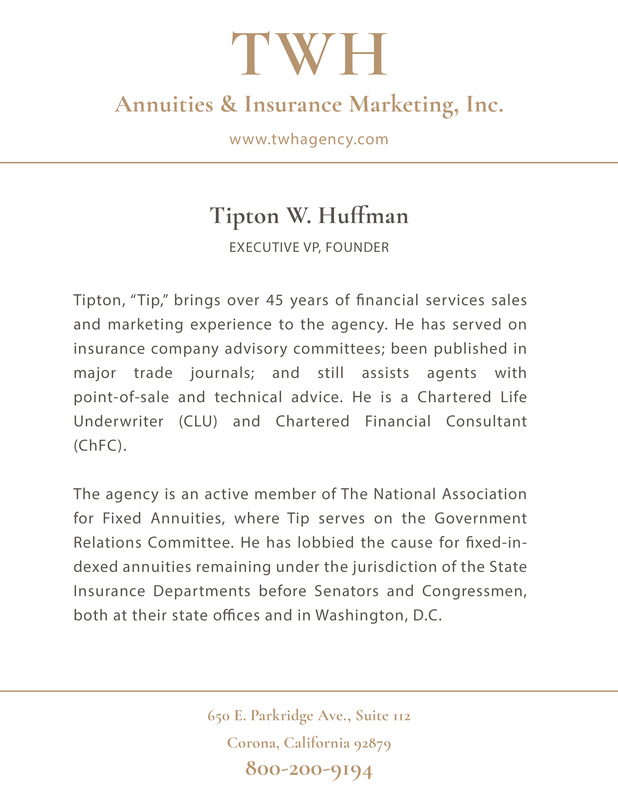 Tip has 45+ years of successful sales leadership within leading insurance companies, nearly half of those as the driving force behind TWH Annuities & Insurance Marketing, Inc.
Ami brings 10+ years professional experience in insurance customer relations, account management, brokerage sales & service, and benefits administration. With over 3 decades experience as a Life and Health Agent/Broker. 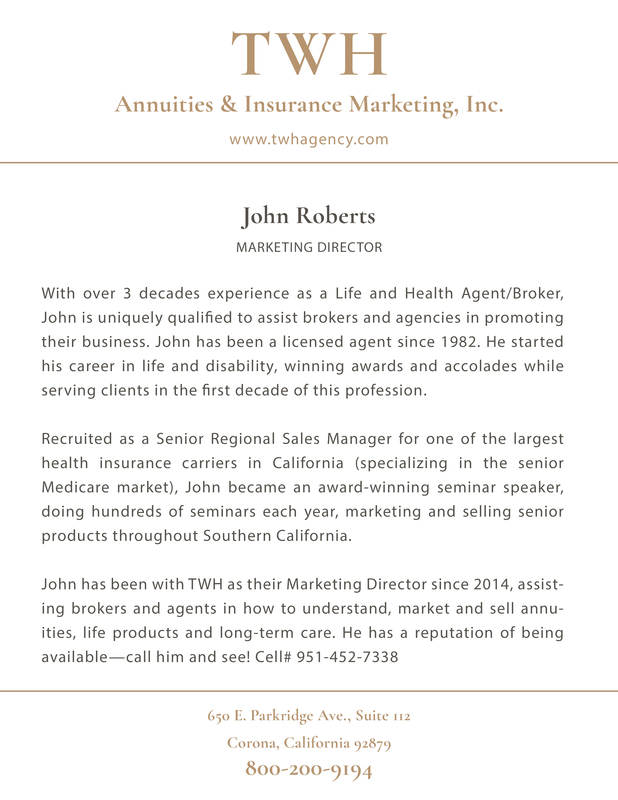 John is uniquely qualified to assist brokers and agencies in promoting their business goals. Our seasoned team of professionals has over 125 years of experience to offer you. We offer a full array of resources to benefit you and grow your business. We hold several events throughout the year which provide you with powerful tools. We have built a network of top-level carriers in order to provide you the greatest selection. Two benefit programs are available to you, rewarding your hard work! We know it is crucial for you to have up-to-date investment news. “We've been at this for a while, so we know how to deliver results.